Strictly speaking the Florists’ auriculas are a hybrid between two wild Primula species, Primula hirsuita and Primula auricula with the hybrid name Primula x pubescens. 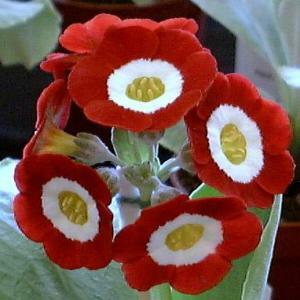 Typically however they are found listed in catalogues as Primula auricula cultivars. Auriculas were brought to the UK by Huguenot weavers (Protestant French refugees of the 16th Century). Whilst employed at home on their work they were able to devote time to the care of these delicate plants. The ‘show auriculas’ are typically grown in clay pots in a compost with good drainage in a cool place out of direct sun. Their beauty rests in the contrast of colours on the petals and the fine meal (known as farina) which dusts every part of some varieties like caster sugar. Scorcher is a bright crimson variety which displays this farina well on its grey foliage. The breeders of such plants are fanatical and dedicated – so don’t forget to look closely at each plant to fully appreciate the work that goes into these little gems!